We are running deep into the age of portable computers and right now they have almost replaced the conventional desktop computers in our daily lives. The need of portable computers was felt when people wanted to access their computers outside their homes. Eventually, the humans were more in need of “on the move” computing. A lot of portable computers have been introduced over time, capable of operating independent on location or surroundings. These devices usually came with internal batteries to keep them running irrespective of movement. Portable computers are also known as laptops because they can be operated on our laps and carried easily. 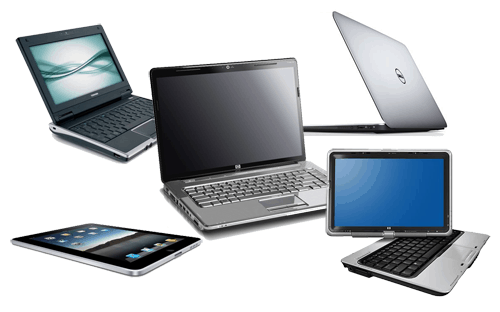 Laptops can be broadly classified in two categories – Notebooks and Netbooks. A notebook is a portable computer which has a processing power similar to a desktop computer. It weighs around 5kgs and has batteries capable of running it for 4 to 5 hours without any external power source (assuming the battery is fully charged). They have a screen size of greater than 15 inches and support high resolution displays. The mouse is replaced by a touchpad keeping in mind the portability factor. Some touchpads also support multi-touch gestures (for zoom, rotation, scroll, etc.). Notebooks allow most features that a normal desktop offers. It usually comes with built-in multiple USB ports and contains a CD drive (including DVD and Blu-Ray disk read/write capability). Some laptops also have a VGA slot to connect an external display or even a projector. Nowadays, notebooks are also capable of processing high-end graphics and are suitable for gaming. Notebooks are also easily customizable now as internal peripherals are easily available in the market. Notebooks also offer features like Bluetooth and Wi-Fi support. Since all the features of desktop are offered within a notebook with the additional form factor of portability, notebooks are generally priced at a higher range than desktops. Netbooks were designed to offer the basic computing functionalities in a smaller, lightweight, more portable device. Netbooks generally weigh around 1-2kgs and have smaller screens, which vary from 7 inches to 12 inches diagonally. Since netbooks are smaller in size, they do not come with any in-built CD drive. They also have limited processing powers and are not suitable for rendering high-end graphics. They usually support low screen resolutions and are only suitable for general office work. Netbooks are cheap as they have limited capabilities. Netbooks are also used for internet browsing although the experience is less smooth as compared to browsing on a notebook. Also read on how to choose your laptop depending on your requirements. Recently, a new series of laptops known as Ultrabooks has been released. The term was first defined by Intel. Later on, other manufacturers also started manufacturing similar devices under the same name. An Ultrabook is a thin, lightweight and portable device with the processing power of a notebook. They are designed to provide benefits of both notebooks and netbooks at the cost of a higher price. Ultrabooks feature Solid State Drives (SSDs) for faster disk operations, greater persistence and better performance. Another type of portable computer is the Tablet PC. Tablet PCs come in two types: The folding form factor like normal foldable laptops, and the slate form factor like the iPad, ePad, etc. Tablet PCs having the folding form factor usually have rotating screens which can be fully flipped over around a central axis. These tablets come with a full size physical keyboard and usually support Desktop OSs like Windows (eg. HP tx tablet series). The slate form factor tablet PCs (sometimes referred to as “Pads“) usually don’t have a physical keypad and rather rely on an entirely touch based interface (virtual keyboard). These Pads usually run on Mobile Operating Systems (like iOS, Android) and include in-built peripherals like GPS, G-Sensor, etc. In addition to the features available on general notebooks, tablet PCs have the additional feature of processing touch inputs. The screens are sensitive to touch and users can interact with either bare hands or a pen-shaped stylus. Many of the modern touchscreens are also capable of processing multi-touch gestures. Tablet PCs enhance the way users interact with the computer. Tablet PCs are generally provided with powerful processors to let the users have a smooth and hassle-free interactive experience. So, this was all about the different types of portable computers. Please comment and share the post if it was helpful to you.